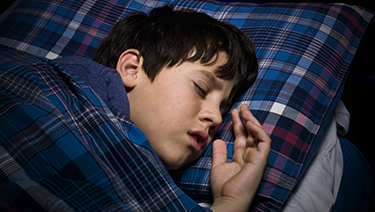 ​Children with autism spectrum disorder, and those with other types of developmental delays who have symptoms of the disorder, often have a harder time getting to sleep and staying asleep, according to a study in the March 2019 issue of Pediatrics. "Sleep Problems in 2- to 5-Year-Olds with Autism Spectrum Disorder and Other Developmental Delays" compared sleep habits of 1,987 children ages 2 to 5 years from multiple locations within the United States. Children were divided into four groups: children with a classification of an autism spectrum disorder, children with other developmental delays with characteristics of autism spectrum disorder, children with other developmental delays without characteristics of autism, and children in a general population group. Researchers found that children with autism spectrum disorder or other developmental delays with autism characteristics were more than twice as likely to experience sleep problems as children in the general population group. They theorized that several factors are likely to contribute to sleep problems for the groups with characteristics of autism spectrum disorder including anxiety, difficulty making transitions, and differences in melatonin production. Since childhood sleep problems have been shown to affect a child's daytime behavior and quality of life for children and their families, the authors conclude that further research on causes and treatments for sleep problems in this group of children is needed.